Each day your body fights to maintain a measure of health and wellness. Probiotics are essential to support the everyday functions of your gut and immune system. (Note: Probiotics can especially effect women’s health. Read the article Why every woman needs probiotics.) 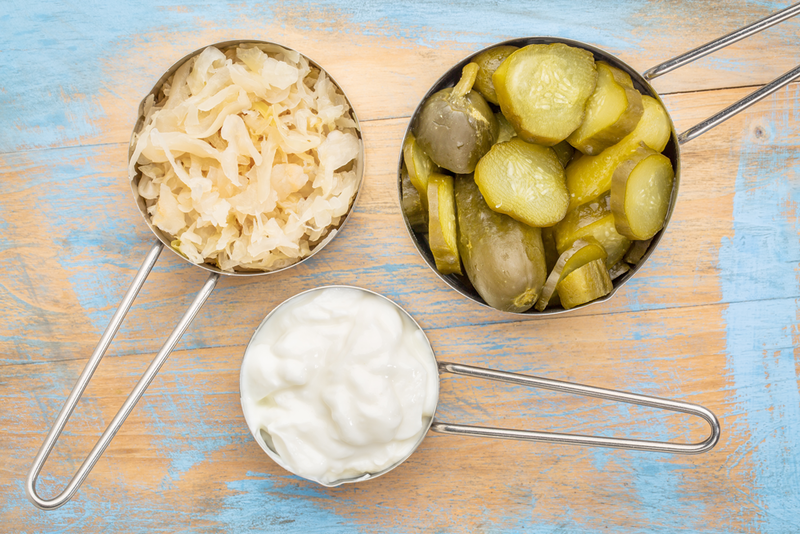 Taking probiotic supplements makes it easy to reinforce your health on a daily basis, but did you know you can also gain a healthy amount of probiotics by choosing probiotic-rich foods? Kombucha is a fermented tea that contains a healthy serving of probiotics. It supports digestion, mentail clarity, and balances mood. Since kombucha is usually made from black or green tea it contains small amounts of caffeine and therefore makes an excellent alternative to coffee in the morning. Bonus: Kombucha is slightly effervescent and also serves beautifully in a wine glass as an afternoon “mocktail”. You can find kombucha at your local grocery store in the refrigerated single-serve drink aisle. Yogurt is one of the most well-known probiotic-rich foods. But did you know that many yogurts at your local grocery store do not contain any live cultures? They therefore offer no probiotic benefits! When shopping for a yogurt always check the label to make sure the product contains “live active cultures”. In addition, some yogurts can be extremely high in sugar so we recommend choosing a product that contains no sugar or chemical sweeteners. Top your yogurt with a little maple syrup, fresh fruit, nuts, or cacao nibs. If you have trouble digesting lactose opt for a dairy-free yogurt. You can find delicious coconut or almond milk yogurts at specialty grocery stores like Wholefoods. Tempeh (pronounced temp-ay) is made from fermented soy beans and is rich in probiotics, protein, fiber, and Vitamin B12. It has a firm texture and is similar to tofu in appearance. Tempeh makes a great alternative to meat on those “meatless-Mondays” or in vegan dishes. To retain the most probiotics, serve the tempeh uncooked over a salad or steamed veggies. To enhance the flavor, marinade or top the tempeh with citrus and your favorite sauces or herbs. Miso is a seasoning that has been made in Japan for many thousands of years. Miso is made by fermenting various types of beans and grains. It is used for making soups and flavoring sauces. Popular types of miso include: Shiro miso (white miso); Kuro miso (black miso); Aka miso (red miso). Each of these varieties are good to use for adding probiotics to your meal. Remember though, if you boil the miso to make soup, all the probiotics die and are thus worthless! Try making a miso salad dressing or dipping sauce. Sauerkraut is made from fermented cabbage and makes a great topping for barbecue dishes. Kim chi is similar to sauerkraut in that it is also made from fermented cabbage but has a much stronger smell and is usually a bit on the spicy side. Kim chi pairs well with Asian cuisine and makes an excellent salad topper or can stand alone as a wonderful side dish with fresh sushi. Pickles can contain a healthy amount of probiotics and Vitamin K- but please check the labels! Pickles made with vinegar do not contain probiotics so make sure your pickles are fermented in water. In addition, some pickles can contain a high amount of sodium so look for a low-sodium option. Pickles can be enjoyed alone as a mid-day snack or are delicious served on a sandwich or in a wrap.